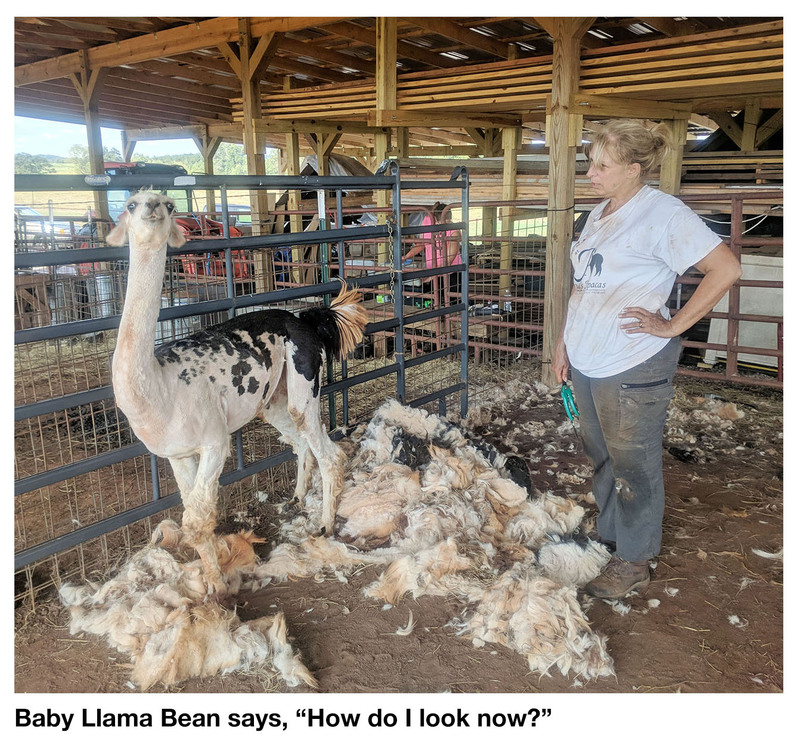 If you doubt that, you missed our llama-shearing day. But first, I need to tell you what happened last time. George and Georgette were beyond shaggy. With a good beagle, you could have jumped a rabbit in the thicket of hair on their backs. I knew the llamas needed haircuts, but finding someone for the task was tough. After a passel of phone calls, I found a fellow up near North Carolina. With that assurance, I invited him to Lake Hartwell. The next Saturday, he drove 90 miles. I had the llamas corralled. 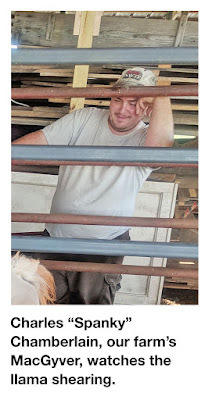 The plan was to use a metal cattle panel and squeeze the llamas—one at a time—into a small space, so he could put on a halter and lead rope. We started with the alpha male, Big George. He runs the llama show. And when we closed in on him, the boss llama went nuts. I don’t speak llama, but his bleating said something like, “No way, Jose!” The cousin to a camel turned into a mountain goat. The llama kept trying to climb the 6-foot-tall corral panel. With each lunge, I prayed George wasn’t going to hurt himself or us. Sweat was dripping off the nose of the I’ve-sheared-one-thousand-llamas man. I knew what he was going to say before his mouth opened. And then he gasped, “I declare this llama can’t be caught.” I said, “It looks like our llamas may go to heaven—one day—with bad hairdos and hot.” One hundred and eighty miles was too far to drive on a flat wallet, so I paid him anyway. The mission wasn’t a complete bust. I bought knowledge of what not to do next time. 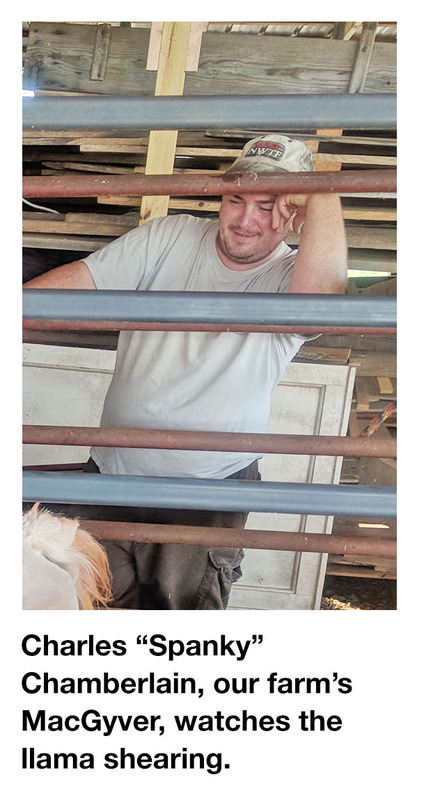 Spanky—our farm’s version of MacGyver—and I got the new barn logistically ready. 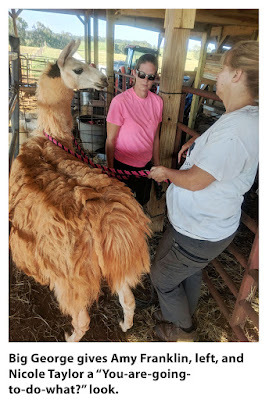 All I had to do was find another llama shearer. Thanks to Mike and Carrie Russell of Sweetcheeks Farms in Oglethorpe County, I met could-be descendants of Job, Nicole Taylor and Amy Franklin, from Spirit Fiber Works in Cleveland. 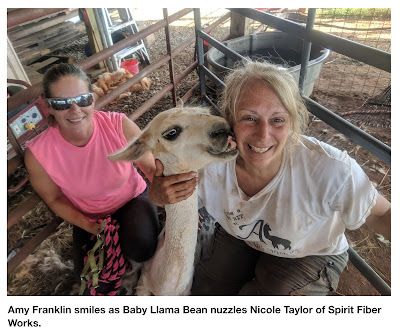 These ladies do speak llama. George; his pasture spouse, Georgette; and their offspring, Baby Llama Bean and the Dalai Llama, weren’t thrilled about getting their fiber shaved, but Nicole and Amy cooed them into a peaceful mood. Womanpower versus manpower proved to be magic. Only George and Bean required mild sedatives. Llamas are infamous for spitting. Throughout the morning, there was plenty of nervous gurgling. Just once did Amy cover her ear for protection, but loogies never happened. Except for Georgette, humans haven’t touched our llamas. When the animals got excited, the ladies just backed away and stood still. Using Biblical-like patience, they did not hurry or raise their voices. Before long, the critters and Nicole were swapping nose nuzzles.